In our series of Best CPU guides, here’s the latest update to our recommended workstation CPUs list. All numbers in the text are updated to reflect pricing at the time of writing. Numbers in graphs reflect SRP for AMD and 1k pricing for Intel. Sometimes choosing a CPU is hard. So we've got you covered. In our CPU Guides, we give you our pick of some of the best processors available, supplying data from our reviews. Our Best CPUs for Workstations guide mostly covers workstation processors available to consumers, although some server products cover both segments. Our best pick here isn’t the fast overall CPU, it isn’t even the fastest single threaded CPU, and it is not the best bang-for-buck CPU. So why pick it at all then? Overall, it performs really well in all categories. Let me explain. The 2950X is less than half the cost compared to the Core i9-9980XE, which has two cores more and some extra IPC, but the 1950X has a much better performance-per-dollar ratio for almost all our tests. It offers a full 60+4 PCIe lanes for coprocessors, compared to 44, and it matches the Intel for DRAM support. Technically the Ryzen 5 or Intel Pentium processors have the best absolute bang-for-buck, but these have a low overall performance: a workstation processor still needs a good absolute performance. The 2950X sits joint top in our compile test, just ahead of the Skylake-X processors. The 2950X replaces the 1950X on our list by virtue of the improved frequency and updates. It outperforms its bigger 24-core and 32-core counterparts most tests except rendering, and motherboard vendors are more than capable of taking the 180W TDP. The AMD Ryzen Threadripper is a jack-of-all-trades. In most circumstances it is not the absolute best CPU, but it strikes as the best all-rounder. For the top performance, I’ve picked two processors for different reasons, depending on the workload. For some workstation users money is no object – it can easily be amortized into the step up in the speed of the workflow. But what a user get will depend on their access to hardware. For prosumers building a system, or buying at retail, then the best option is the Intel Core i9-9980XE. This processor is set to be on the shelves of the usual retailers, and offers eighteen of Intel’s high-performance cores as well as AVX-512. Over the previous generation i9-7980XE it gives an extra 7-10% performance due to a frequency increase, for a few more watts of power. The heatsink is also soldered, to help with temperatures. For users that have software optimized for multithreading or vector instructions, Intel has you covered here. Some workstation users will need ECC memory, and up to 512GB of it. When memory has an error rate of 1 error per GB per year, using 512GB ensures almost two bit errors per day: something that a 60-day simulation would find catastrophic. 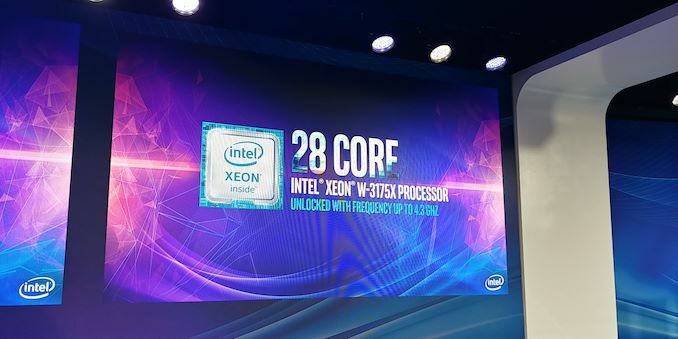 The top Xeon-W processor from Intel’s workstation line is the Xeon W-2195, offering almost the same as the Core i9-9980XE but with ECC RDIMM support and a few more PCIe lanes. Our alternative processor here is the 32-core AMD Ryzen Threadripper 2990WX, with a suggested retail price of $1799. Even though it has 14 more cores than Intel, the 2990WX has a bifurcated memory strategy, which actually harms it in a number of tests. Despite having access to 32 cores, we found that it might perform worse than the 16-core 2950X for sost things. But there is one set of workloads where it does really well: rendering. It took the top spot, often by a large margin, in all of our rendering tests, including Corona, Blender, Luxmark, and POV-Ray. We have relevant reviews for both the Core i9-9980XE and the Threadripper 2990WX that are well worth reading. The attachment rate for PCIe accelerators or co-processors (GPUs, FPGAs, MICs) in workstation environments is typically more than one per system, higher than that of gamers. A number of users rely on having high-speed and low latency PCIe access for these accelerators to accelerate their workflow, and the CPU becomes ever important when these accelerators also have to talk to each other. These recommendations are based on having no large PCIe switches on the motherboard. Otherwise, the most bargain basement processor would be suitable. For processors that a user can buy off the shelf to put into their own system, the AMD Ryzen Threadripper 1900X is an eight-core processor with simultaneous multi-threading that supports 60+4 PCIe 3.0 lanes on the motherboard. AMD often suggests that these are split into x16/x16/x16 for coprocessors leaving three PCIe 3.0 x4 slots left for storage, although anyone looking for maximum density could see x8/x8/x8/x8/x8/x8 if a motherboard was built in this way. 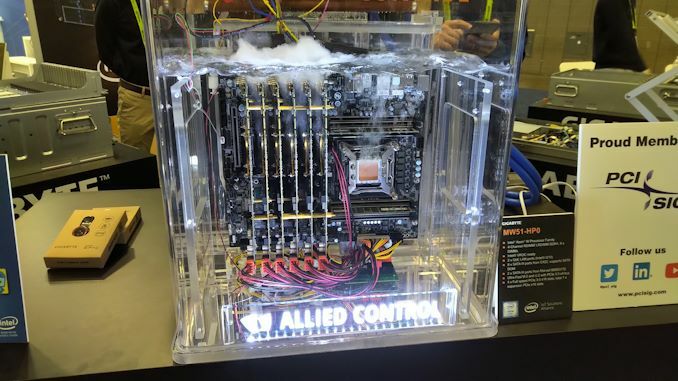 As a single socket solution (that doesn’t require ECC), the 1900X gets the nod. In a single socket system where more PCIe is required, an EPYC 7251/P fits the bill. This processor supports 128 PCIe lanes with up to seven accelerators in that configuration, so the EPYC 7251 wins out over the 1900X. This is where someone from Intel says ‘what if GPUs need to talk to each other? The AMD multi-die strategy kills GPU-to-GPU performance due to added latency and limited bandwidth would an extra PCIe switch!’. This is true, but nothing that Intel has in its arsenal has near 60 PCIe lanes from the processor. The nearest is 48 PCIe lanes from any of the Xeon-W CPUs ($294-2600), or 44 lanes from the Core i9-7900X ($999). 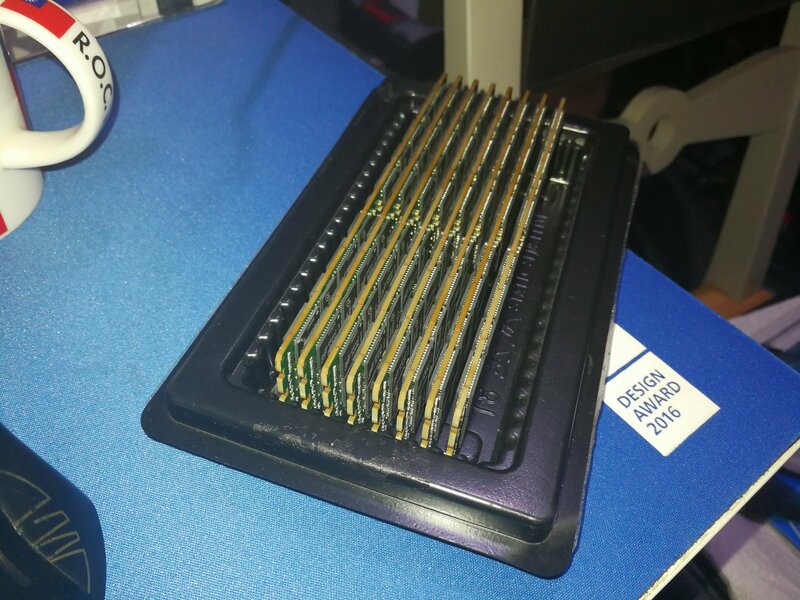 Technically these chips are built with 64 PCIe lanes, but 16 of them are fused off, to be used for Xeon models with OmniPath built into the package. Someone might say that Intel’s X299/C620 chipsets can support another 24 PCIe 3.0 lanes giving 68 and 64 lanes in total respectively, but then we come to the argument of added latency when talking GPU-to-GPU across the CPU-to-chipset connection, but also these extra PCIe lanes are not built for accelerators. In order to get more PCIe lanes from Intel, we have to look at 2P systems, which can offer up to 96 PCIe lanes in total. The cheapest 2P processor from Intel with the full set of PCIe lanes is the lowest processor: the Xeon Bronze 3104. This part only has six cores at 1.7 GHz, but it can offer 48 PCIe lanes on its own and support up to 768 GB of ECC RDIMMs. When two sockets are populated, assuming the motherboard manufacturer has made all the PCIe lanes available through the slots, then up to 96 PCIe lanes could be offered. In this configuration, the accelerators connected to the same CPU have the lowest latency, and those on the other CPU will have additional latency over the QPI link. The user will also have to deal with a non-uniform memory distribution on the processors, which most enterprise software should be able to deal with. Sometimes all you need is memory. Storing that big database near the CPU, rather than in fast storage, makes a difference to average latency and turn-around times. In this segment, many years ago, Intel promised their 3DXPoint memory modules to expand DRAM capacity ten-fold would be available by now. We’re still waiting for that technology to be monetized, so while we wait there are other options to consider. Top of the box is any of AMD’s EPYC range, so here we list the cheapest which offers the most memory for the lowest price. The EPYC 7251 has eight memory channels at two DIMMs per channel, meaning it can support up to 2TB using 128GB LRDIMMs or 1TB using 64GB RDIMMs. That is a lot of memory (~$60000 for 2TB) for such a low price chip. Actually, if you are buying that much memory, it would probably make sense to go for the high-end EPYC 7601 which costs the same as one stick of memory. 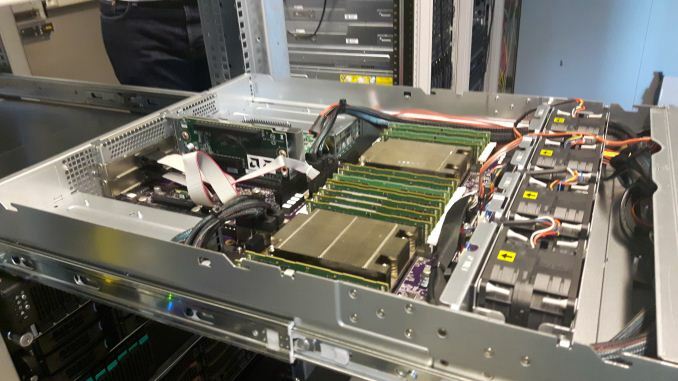 The EPYC 7601 can also run in a dual processor system, allowing for a total of 4TB in one server. One of Intel’s reasons for having their Xeon Platinum and Gold range only support 768GB by default, and charging +$3000 per CPU for upgraded 1.5 TB support models, is that less than 5% of servers require more than 768 GB of DRAM. For the other 95%, Intel’s Xeon-W processors can support up to 512GB with RDIMMs or 128GB of UDIMMs, with the cheapest processor being the Xeon W-2123 at $294. While the W-2123 should be coming to retail, we are still awaiting the motherboards to make an appearance, so while a self-build might be an option, these parts might still be OEM only for a while. In the past few weeks, we have seen Intel launch its Skylake-X Refresh processors, and AMD fill out its Ryzen Threadripper 2000-series lineup. 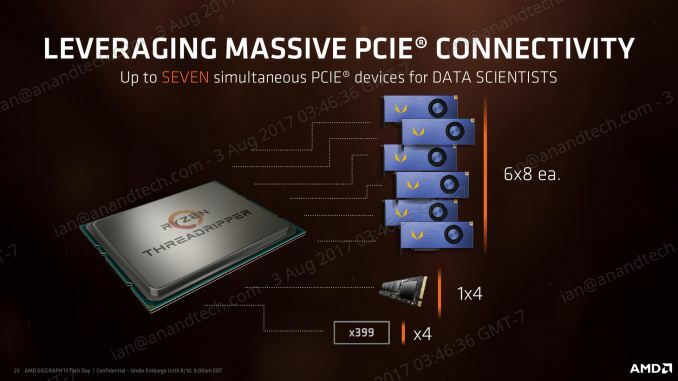 AMD also lifted the lid on its 64-core Rome processors, and while AMD hasn’t given a launch date for these, rumor has it that those are more for the second half of 2019. The main processor coming up worth thinking about is Intel Xeon W-3175X, a 28-core overclockable processor. Details about the Xeon W-3175X are relatively thin, although Intel has promised it will be out by the end of the year. Intel stated that it will support up to 512GB of memory, have 44 PCIe lanes, and users can adjust the per-core frequencies for overclocking. We’re still waiting for information such as overclocked power, what motherboards will be available, and most importantly, cost. Many users are estimating it to be in the $3k-$5k range, and it might be making an appearance in our ‘money no object’ section, at least on paper. That being said, anyone looking to build a new workstation is probably in a good position to start doing so today. 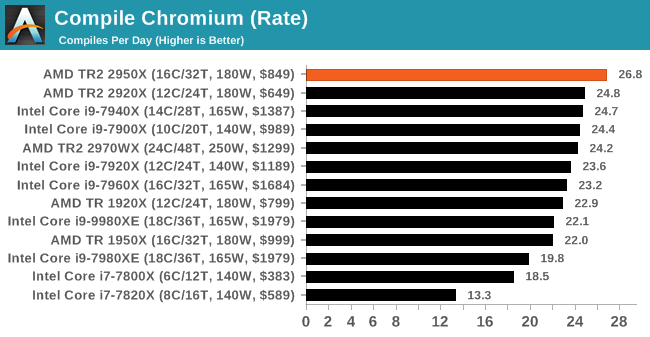 We are slowly putting EPYC data into our benchmark database, and our next big review is likely to be the W-3175X, so stay tuned for that. To me it's always been "workstation" as in the station where I work at. If that's a dual core dell laptop on a desk, then that is my workstation if I'm currently working on it. ECC memory is not that expensive. The one company ripping people off in this regard is Intel, intentionally making consumer chips less reliable by fusing off ECC support. ECC memory should have been standard for a long time. Fortunately, AMD is back. $employer is in the middle of offloading tens of thousands of dual-Xeon workstations in favour of single-Xeon (E3s and E5s), simply because they never bothered to confirm if users' workloads were highly threaded. They were not, resulting in the 'high end' workstations performing like garbage when compared to the lowly 'back office' machines with desktop Core i5s. For some fields such as game development, the fast single-threaded performance vs more cores problem is muddied even further by the specific task. Compiling code and shaders and doing baked lighting are inherently multi-threaded so the Ryzen 1700X on our build machine is great for that. But at the same time, the importing of assets such as 3D models, animations and textures can be ridiculously single-threaded in some engines. It would be nice to see more work station tests in this article. I would not actually consider compiling applications as workstation type work. I would think application like SolidWorks would be good example. I do think applications like 3D Particle stuff is good.